Belize City is the largest city in the Central American country of Belize. This city of 57,179 people is located on a small peninsula protruding into the Caribbean Sea. As home to local courts and most government officials it was the de facto capital city of the nation until flooding and other extensive damage from Hurricane Hattie in 1961 prompted the government to relocate to Belmopan in 1970. Belmopan was also selected because it is nearer the geographic center of the country. Belize City has a centuries-old history. It was near the site of several Mayan city-states until that culture’s decline at the end of the first millennium A.D. It had previously been a small Mayan city called Holzuz. By the 1600s English and Scottish pirates used the area’s many creeks and mangrove swamps as natural hiding areas and a base of operations from which to raid passing Spanish ships for gold and silver. By the beginning of the 18th Century, the English laid claim to the area, a claim that was disputed by Spain. In 1854 Belize City and the region surrounding it became the colony of British Honduras. Belize City was originally founded at “Belize Town” in 1638 by English lumber harvesters. Belize Town was ideal for these businessmen as a port and commercial center because it had a good harbor which was the natural outlet for a network of rivers and creeks which could be used to transport lumber from the interior. These timber businessmen shipped logwood and mahogany to other English colonies in the Caribbean and eventually to England itself. Belize Town grew as the lumber trade prospered. The work force used for the cutting and extracting of this lumber was for the most part slave labor imported from other Caribbean islands or from West Africa. By 1800 slaves and descendants of those freed from slavery comprised the majority of the inhabitants of both Belize Town and what would eventually be the entire colony of British Honduras. By the 20th Century Belize Town was inhabited by a number of groups in addition to the former slaves (Great Britain freed all slaves in its overseas colonies in 1833). They included both English and Spanish residents, some Chinese, Lebanese, and people from India. There were also significant numbers of Mayan Indians in the city. The Garifuna were some of the more recent arrivals in Belize City although they had lived in British Honduras for some time. The Garifuna (or Black Carib) were the descendants of Africans and Native Americans. Originally inhabitants of the islands in the eastern Caribbean, they were relocated by the British to the coastal regions of British Honduras in the mid-19th Century. Belize City today continues to be heavily infused with British culture. St. John’s Cathedral, which began in 1812, is the oldest Anglican church in Central America. The city is also home to the Museum of Belize and the three campuses of the University of Belize. Despite the capital’s relocation to Belmopan, Belize City remains the country’s principal port and its financial and industrial hub. 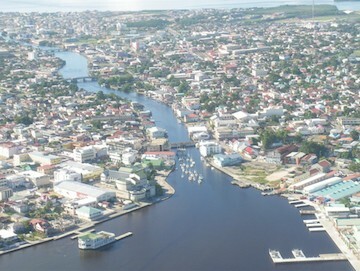 www.nativeplanet.org/indigenous/garifuna.htm; “History of Belize City,” http://www.belizedistrict.com/history.html.